The core area of the Kushiro Marsh was designated as the first Ramsar Site in Japan when the country became the member state of the Ramsar Convention in 1980. The majority of the marsh including some surrounding areas was then designated as a national park (28,788ha) in 1987. Kushiro Marsh is the largest marshland remaining in today's Japan. The symbol of the long conservation efforts for the marshland is endangered red-crowned crane (Grus japonensis). Cranes in Kushiro Marsh attract a lot of tourists and photographers from around the world, especially during winter when a large number of cranes can be seen at some feeding stations. 'The Kushiro Marsh Restoration Project' has been carried out since 2005, comprising of several restoration components such as restoring the original meandering river course of a part of Kushiro River within Kushiro Marsh. Yet a new problem on maintaining the ecological characters of Kushiro Marsh has emerged. It seems that the number of residential wild deer (Cervus nippon yesoensis) in central Kushiro Marsh has increased. There was no mention of any deer problem in the original "Overall Concept of Nature Restoration of Kushiro Marsh", published in 2005. The ecosystem management work is in position and will be carried out by the Ministry of the Environment (MoE) in due course within Kushiro Marsh National Park to control the number of wild deer. Nakaikemi wetland is a relatively small remaining mire surrounded by hills. The Ramsar designation of the wetland was officially announced during the Ramsar COP11 (Bucharest in 2012). 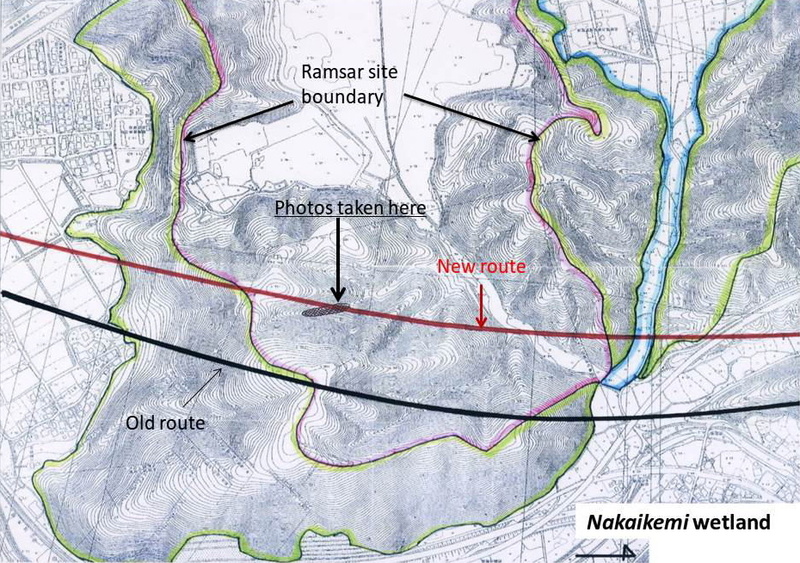 Considering the catchment approach, some parts of surrounding hills were also included in the Ramsar Site. The Mayor of Tsuruga City, where the Nakaikemi wetland is located, and members of a local conservation NGO for Nakaikemi wetland all came to Bucharest to celebrate the official designation of the site. However, just before the official designation of the site, local newspapers have revealed that the new route of bullet trains would pass through the Ramsar designated area to the Tsuruga Station. JAWAN (the Japan Wetlands Action Network) submitted its petition regarding this issue. The National Report of Japan to the Ramsar COP12 stated that likely change in the ecological character of Nakaikemi has been reported to the Ramsar Secretariat in accordance with Article 3.2. In addition, the draft National Report of Japan to the forthcoming Ramsar COP13 stated that in reviewing the routes of Hokuriku Shinkansen train (bullet train) plan to be constructed near Nakaikemi wetland, the operator conducted an impact analysis on flow rate, groundwater level, and precipitation, and analyzed the impact that construction will have on nearby groundwater and that, following the analysis, a route predicted to have minimal change in groundwater was selected. However, the new route still pass through this tiny Ramsar-designated wetland area and many conservationists in Japan worry that the construction work may negatively affect the wetland. It is not surprising that almost 90% of coastal area along Tokyo Bay has been already modified. Nevertheless, the first Ramsar designation of tidal flat areas in Japan was done at the Ramsar Kushiro Conference (COP5 in 1993). Yatsu Tidal Flat Area is a land-locked tiny mudflat area (40 ha) which is connected to Tokyo Bay with two channels. The representative of JAWAN (Japan Wetland Action Network) on behalf of all conservation NGOs attended at the Ramsar COP5, highlighted the following points during his official statement made at the plenary of COP5 in Kushiro: i) intertidal mudflat areas are most threatened wetland type in Japan; 2) there are many threatened mudflats in Japan, but four such areas are most important - Isahaya, Wajiro, Fujimae, and Sanbanze. Among these four major tidal flats in Japan, only Fujimae became a Ramsar Site so far. The former Secretary General visited Sanbanze in September 2001, confirmed the tidal flats are worth registering as a Ramsar Site and encouraged all stakeholders concerned to facilitate its designation. The Chiba Prefectural government has announced its plan to construct a new road network to mitigate traffic jam along the shoreline of Tokyo Bay. The Sanbanze area and its surroundings are of possible candidates under future road construction projects. Thus the designation of Sanbanze as a Ramsar Site might be substantially delayed until the concrete road network plan is put on the table, or not possible at all if the new road network will pass through the Sanbanze area. The whole Ariake Sea was selected as one of 24 most important wetlands in Japan within "A Directory of Asian Wetlands" (1986). The Ariake Sea (Bay) is a vast inner sea surrounded by four prefectures in Kyushu Island, one of four major islands in Japan. 'The Isahaya Reclamation Project'was initiated in late 1986 in Nagasaki Prefecture, the westernmost prefecture among four prefectures surrounding the Ariake Sea. The Isahaya Bay is located in the northwestern part of the Ariake Sea. Local fishermen in four prefectures had pointed out that some commercial fish catch has declined drastically since the project was started. The construction of seven-kilometer seawall was completed in April 1997 by shutting down two sluices at the seawall. Isahaya Bay used to hold the largest intertidal mudflat area in Japan. There were hue and cry in Japan over the reasoning of such the loss of tidal mudflats. The then Secretary General of the Ramsar Convention officially inquired the situation of Isahaya Bay to the Japanese Government after the shutdown of the seawall in Isahaya. Ariake Sea has been famous for many types of seafood, especially for its Nori seaweed. The Nori aquaculture has been of the greatest commercial value among various kinds of seafood available in Ariake Sea. Collected Nori was dried and processed to black-paper material that is used for sushi and various types of rice balls sold at all convenience stores and supermarkets throughout the country. Nori made at Ariake Sea has been known of the highest quality. the Saga Court ruled that sluices at the Isahaya seawall should open. the Nagasaki Court decided the temporary suspension of the opening of sluices. the Fukuoka High Court ruled the cancellation of its decision to open the sluices. The Henoko issue involves the relocation of US base in Okinawa Prefecture, the southernmost prefecture in Japan. The area holds the largest seagrass beds in Okinawa Island, supporting endangered Dugong (Dugong dugon) and sea turtles, as well as a unique blue coral colony. The initial construction work of seawalls for the new US military base has begun in 2017. The Secretary General to the Ramsar Convention sent a letter to the Japanese Government, inquiring information on the situation of Henoko, Oura Bay. Awase coastal wetland is a wetland complex of 1,100ha, including tidal flats (approximately 265 ha) with seagrass beds, surrounded by coral reefs. The first phase of constructing an artificial island (95ha) has been carried out. The National Report of Japan submitted for the Ramsar COP11 stated that at Awase-higata (tidal flats) in Okinawa Prefecture, a project to build an artificial island is in process, and in part, concern about the partial loss of ecological characters exists. The Secretary General to the Ramsar Convention sent a letter to the Japanese Government, inquiring information on the situation of Awase tidal flats. See more detail on the web site by the Japan Federation of Bar Associations.